As 2016 heats up, mobile gamers are following the election and engaging with candidates via social media, despite being largely ignored by campaigns. That’s a top finding in a MocoSpace Community Check-In conducted by Social Lens Research. The survey had 2,351 completes and was fielded last weekend, February 13 to 14 without an incentive. The respondents were 46% white, 31% African-American and 16% Hispanic. MocoSpace is a top mobile gaming community with more than 50 million users. This diverse community represents digital-first populations who live online, are eligible to vote and plan to vote in above average numbers.They are highly active on social media, and widely broadcast their views to their networks. And they are a growing part of the electorate. Gamers are expected to grow to close to 56% of all Americans in 2016, and mobile games are played weekly by half the likely voting population. A third of likely Democratic voters play daily. Opportunity To Increase Engagement: MocoSpace Community members are watching the 2016 campaign carefully. Seventy percent read campaign stories via social media at least occasionally, 31% frequently. But 60% have had no recent contact from a campaign. African Americans The Most Engaged: More voted last time [83%], more are registered to vote now [87%], and African Americans are most engaged with the campaign on social media. And they are solidly for Hillary Clinton – 54% more likely than the general population. Hispanics Not As Engaged: Least likely to be registered, not as committed as African Americans to Democrats or Hillary Clinton. They have had the least [64%] contact from campaigns, despite following it most closely [36%] on social media. Most interested in alternative media [32%] for candidate news. White Middle Ground: They fall between African Americans and Hispanics at 81% for voter registration and at 77% for intending to vote in 2016. And they are more tied to the Republicans than to the Democrats, 26% vs 21%. Democratic Voter Registration Outreach Would Pay Dividends: A quarter of those polled are unregistered or unsure. Some [12%] say they plan to register, but making that easier would be rewarding. Another 14% are eligible but unsure how to register, not clear on their registration status, or have difficulties registering. Resolving these issues with them would benefit candidates. Social engagement Tops The Mobile List: Gamers were asked how they like to see campaign messages on their mobile. The overwhelming choice was for social media, preferred by 54% for candidate’s mobile messaging. Prefer Live or Real-time interaction: Gamers were asked how candidates could better connect with them and their friends. The two most popular choices were in person events [32%] and live Q&A on social media [32%]. Live Q&A on social media channels were slightly preferred by African Americans over in person events. Hispanics and Whites were slightly more interested in attending in-person events. Non-traditional Media Attractive: Gamers third choice was candidate interviews with non-traditional media, such as bloggers & YouTube stars [25%]. These are more popular with Hispanics & African Americans. Campaign Ads Got Mixed Reviews: MocoSpace poll-takers are split on the usefulness of campaign advertising on social media. Fifty-two percent find presidential campaign ads useful, but a third ignore them or have never seen them. Gamers Write Off Most Candidates Social Media Campaigns: Hillary Clinton’s social media efforts are the most popular at 32%, boosted by African American approval at 53%. Democrats are winning with gamers: Gamers were asked which party they favored for President in 2016. They lean Democratic no matter the candidate at 37% percent, with 17% planning to vote Republican for sure. Significant votes are still up for grabs: Undecideds [17%] and those who say it depends on the nominee [18%] are each equal to or slightly larger than the “for sure Republicans”, and together almost match the “for sure Democrats”. Democrats win on the issues with this cohort: The MocoSpace Community Check-In shows that on a wide range of issues gamers have twice the confidence in the Democrats that they do Republicans. Gamers favor the Democrats on jobs & the economy, taxes, healthcare, gay and women’s rights. A huge majority voted for Obama in 2012: The voting history of the mobile gamers we polled skews Democratic. Fifty percent report voting for Barack Obama in 2012, with Mitt Romney backed by only 11%. 24% did not vote. 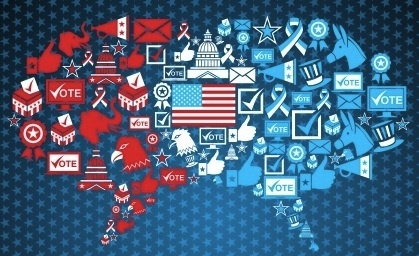 The MocoSpace Community gamers are watching the 2016 election via social media, but the campaigns are failing to effectively connect so far. Mobile and social outreach offer a great opportunity to reach and engage this population. Topping the list of “no brainer” opportunities are live events on social channels and leveraging alternative media to reach new audiences. Please contact Tom Young (tom@sociallensresearch.com) with any questions or inquiries about the study.